By now I'm pretty sure that everyone in America knows about internet predators prowlng through the world of MySpace, luring pre-teens away from the safety of their homes. With that said, please, please, PLEASE find another news story to report on. 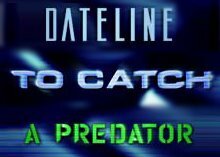 Seriously, unless you plan to officially change your name from "Dateline" to "Dateline: To Catch a Predator" - NO MORE PERVERT SHOWS. I don't mean to sound insensitive—I realize that these creeps need to be stopped and that parents need to monitor their children's internet usage—but I realized that last week when you ran the same show, and the week before that when you ran the same show, and the week before that when you ran the same show. Catching child predators was an explosive story when you first reported on it, but since you've now run 87 or so shows on the topic, it's kind of old news. ENOUGH ALREADY. Enough, enough, enough, enough, ENOUGH. Say what you want about Britney Spears' air quotes, loose false eyelashes and gum-chewing—I was THRILLED to see her mug flash across my TV screen last week. I'd take her talking about her "boos" any day of the week over watching another internet predator show. Anything to break up the monotony, really.